Maryland resident Miranda Prather, a lifelong horse lover who adopted a retired Thoroughbred named Blue Blue Sea, has an amazing story to tell about how her horse overcame odds by surviving a malabsorbtion disorder and several other health issues. I decided to do a little question-and-answer session with her to find out more about Blue Blue Sea, who is living proof that a disease like malabsorbtion doesn’t have to mean euthanasia. Because of Prather’s dedication and patience with Blue Blue Sea, he is now living life to the fullest. Thanks for sharing Blue Blue Sea’s story with us, Miranda! 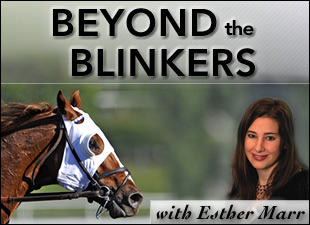 Remember, if you are interested in guest blogging on Beyond the Blinkers, or you feel that you have a story to tell about an ex-racer or a behind-the-scenes experience in the Thoroughbred industry, feel free to email me at emarr@bloodhorse.com. EM: Tell me how you came to own Blue Blue Sea…where and why did you decide to acquire him? MP: Since the first year I watched horse racing (Seattle Slew's Triple Crown races), I have been hooked on Thoroughbreds. I grew up riding them and was fortunate enough to own a first ex-racer when I was in high school. 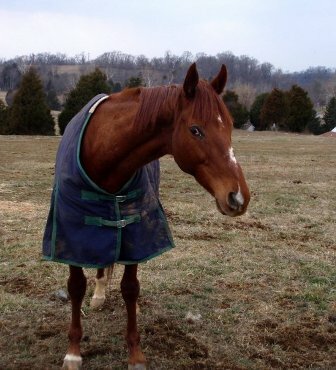 After college, I knew that one day I would have a Thoroughbred again, but had to be sure I had the money first. In 2003, I stumbled upon the CANTER Mid-Atlantic site. It was like a candy store for a Thoroughbred lover! I looked for months. In early 2004, I found the listing for Blue Blue Sea, described as a chestnut gelding by Sea Hero out of an Alysheba mare. He was a chestnut, my favorite color of horse since watching Alydar run, and he was out of a mare (Alytude) who was by my favorite son of Alydar, which of course, meant he was descended from my favorite racehorse of all time. I looked at his picture and was hooked. I've had the luck, too, of meeting both of Blue's grandsires. I met Alysheba in January of the year he passed at the Horse Park and I met Polish Navy twice at Old Friends. Prather went on to explain how she inquired about Blue Blue Sea, but was told his owner had already received several other calls, and that he most likely was already headed to a new home. Prather was disheartened, but kept faith that something good would happen. A little background on Blue Blue Sea: he raced in the claiming ranks throughout his 41-start career on the northeast and Midwest circuits, winning six times, and retiring with earnings of $53,078. A few weeks after Prather’s initial inquiry, she received a call from Blue Blue Sea’s owner informing her that none of the other interested people had committed to purchasing the gelding and he still needed a home. Visiting Blue in person confirmed Prather’s love for the gelding, and she promptly adopted him and made arrangements to board him at a nearby farm. In March 2004, she took the gelding home. EM: Is Blue the first Thoroughbred you have adopted or are there others? MP: After owning a Shetland pony stud when I was around 5, I started taking lessons in Kentucky when I was around 8. The first horses I took lessons on were either Thoroughbreds or Arabians. I owned one other Thoroughbred, a 1979 Argentine-bred chestnut gelding named Beble that went by Jo Jo. He was also an ex-racer. EM: At what farm do you board Blue? MP: When I first got Blue, I was told "no" by a lot of farms because he was just off the track. Luckily a friend of the family had a farm and he was there for seven months. It' been a bit of a challenge finding a good facility for overall care in the area. Currently I have him at C&M Farm in Sharpsburg, Md. EM: Tell me about your experiences with Blue since you’ve owned him. What challenges have you faced and how has he dealt with his malabsorption disorder? (Blue was diagnosed around four years ago with the disease). MP: Blue has been the ultimate horse learning experience. He popped two abscesses soon after getting him. He has a club left foot. His jaw is misaligned--both a parrot mouth and side to side, and he is missing two front teeth. Then after a few months of owning him, a couple of fillies came to the farm and it became quite clear that something was up. His interest in them went beyond the regular gelding-mare interaction. At one point, he even tried to jump out of his stall over the half door and ended up getting caught. The fire department still talks about having to come out and hoist the horse up to get him off the door. After testing Blue’s blood, it was discovered he was only “proudcut” meaning some hormone producing parts were left in. With those removed, he became much better about that sort of thing. In 2009, Blue had to have surgery to remove cancer from a portion of his right third eyelid. So far, it has not come back in any way, thankfully. Also, just before his start of the malabsorption disorder, he survived a slight case of laminitis, probably an earlier indicator of the malabsorption disorder to come. Of course, the biggest challenge has been the malabsorption disorder. 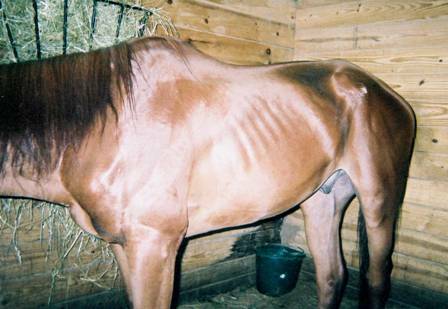 In August 2006, Blue had the first colic episode since I owned him. With several doses of banamine, fluids, and spending the night with him to walk him, he recovered. But two days later, he was colicking again. In a four-week period, he colicked five times and lost around 300 pounds. His regular vets at Valley Equine Associates referred him to the Marion Scott Dupont Center. He spent one night there while they did a battery of tests. The diagnosis came back that he had a malabsorption disorder. Without a biopsy, there is no definitive way to determine which of the bunch it is. Euthanasia was recommended. If I opted to not go that route, I was told he would be on steroids and would likely only live one to two years. Of course, this is not the news any horse owner ever wants to get. I took Blue home and opted for treatment. Since then I have read more veterinary articles than I ever thought I would. The biggest key to his success was getting him off hay. Hay triggers the over-reaction in his gut and is guaranteed to put him to trouble. He was accidently given hay this past December and ended up in the vet hospital for seven days. Blue will colic, that's a fact of life with him. As best I can, I try to limit those episodes, and providing he does not receive hay or anything else off his list of what he can have, he generally only has a handful of episodes each year. He maintains his weight and his coat and eyes are bright and shiny. Unless you see him having an episode, you would never suspect he has such a serious illness. When he is well, he is an exuberant, inquisitive, and happy horse. EM: What tricks have you taught him and what do you enjoy doing together? MP: He's learned to do some basic ones so far-- kiss me, hug me, nodding and shaking his head, and pushing me around (not just when he feels like it). Now we are moving on to some more difficult ones that will involve things like bowing and tricks with bottles and other props. He is a bit A.D.H.D. sometimes, so it takes him a little longer to learn, but once he's got it down, he never forgets. I've seen him give "kisses" to strangers who walk up to him and accidently give off the cue. EM: What would your best advice be for someone that has acquired a Thoroughbred that has special needs or physical ailments? MP: Really, the single best advice I would give anyone for owning any horse is to think about the not-so-pleasant topics that you will likely be faced with some day. Consider financial limitations, emotional limitations, everything you would have to consider if you suddenly were hit with bad news about your horse. You don't need to make that decision at the moment, but at least be thinking so it doesn't hit you unaware. When Blue was diagnosed, friends gave me all sorts of advice. Some came in the form of old articles clipped from magazines. One in particular has struck me as the best advice I received in this journey with Blue. It was about having a horse diagnosed with a chronic disorder and your options. It stated that you first needed to answer one important question: Do you want "a" horse or "this" horse? Small words, but they make a big difference. For me, I wanted "this" horse. Also, you need to be prepared to be your horse's advocate and voice if you do opt for treatment. Most vets are unaware of treatment options beyond steroids for such disorders. You have to push and continue pushing to find new information and discussing that with your vet(s). You need some good luck with that to in connecting to the right vets. I have been very fortunate to have a network of vets and equine professionals who have helped me with Blue--Valley Equine Associates, especially Dr. Brown who has never once yet given up on Blue; Dr. Barton at the University of Georgia whom I first contacted about options beyond steroids; Dr. Stratton-Phelps, Blue's nutritionist vet who has worked up a life-saving diet for him; and Rebecca Douglass, his dentist who keeps his messed up mouth in order and offers insights from Chinese medicine that may assist him. Be prepared for the emotional toll, too. Never before Blue had I had a time where I dreaded going to the barn. I still get that way sometimes, especially if he's going through a rough patch, since you can never be sure what you will find. That said, I would never go back and change my decision. He's more than doubled the life expectancy he was given, and I have had many more enjoyable days than bad with him. EM: Tell me about some of Blue’s personality traits and what you like about him. MP: He's definitely got the TB pride. He carries himself like a million-dollar race horse, loving to show off his speed to anyone who is interested. Sometimes I will race him or play tag with him in the paddock. Other times he will nip his pasture mates into a race. He's never lost that competitive edge. If he deems you worthy, he will be loyal and protect you as best he can. He is still a ladies’ man. It is not at that “gotta have” level, but he sure does like the mares. He also has a trickster side. He delights in taking brush bags in his mouth and scattering them in all directions. And other little things to keep you on your toes. He can get jealous if I pay attention to another horse or if I am with him and start talking to someone else. He will try to put himself between me and the other individual. If that doesn’t work, he will remind me that he is to be the center of the universe by stomping his feet in disgust. One really interesting thing about him is his bucket preference. When Alysheba returned to the states, I remember reading in an article that he would only drink from a blue bucket. I wondered about that and my more skeptical side wondered if there was any truth to it. Blue has always been a bad drinker. He doesn't drink much even in the best of times, which can lead to more colic issues. I finally broke down last year and tried the blue bucket. Blue went over right after I filled it and drained it. He still doesn't drink as much as I would like him to, but he drinks far more now that he, too, has a blue bucket. Maybe it seems more like fresh water that way, who knows, but really interesting that they both did that. Overall it's that "big" Thoroughbred personality with a heady dose of fire that I absolutely love. EM: Anything else to add about Blue? MP: Just that to me, Blue's greatest gift to me and others is education. Personally, I've learned to give injections (both IM and IV), deal with equine emergencies in a calm and controlled manner, detect little signs that point to bigger trouble ahead, learn how to manage a diet for such a horse, and a thousand and one other little things that are medical related. I've also learned the importance of thinking on important decisions before the event happens-- euthanasia, plans for the horse's body after death, and all that sort of thing. The children and adults who Blue has touched at the barn and through my network of friends have seen firsthand that there are some very serious things you will likely have to consider when owning a horse. Thinking about those things doesn't put a damper on the enjoyment, but will make those moments--if and when they should arrive--all the more easy.